Our nation’s capital is oft maligned and ridiculed for its weather, with good reason, but it also has one of the most pro-active and go ahead councils and tourism boards in the country – ones that dare to be just that little bit different. This has led to Wellington becoming the capital for art, shopping, sport and dining in New Zealand. A place other areas of the country could genuinely learn from. Many may disagree with my comments and some of you may be right, or have your own thoughts – it is, after all, one man’s opinion. But read on – judge for yourself! For the past three consecutive years three Wellington restaurants have been “crowned” Supreme Winner – Cuisine magazine Restaurant of the Year. I was lucky enough to eat at two of these places whilst in Wellington and I have to say, I can see why they won their awards. Matterhorn, Sunday night, packed to the rafters. A bit dark for my liking but everyone seemed to be enjoying themselves. My entrée of Roast Scallops with leek and corn salad was delicious but it was the main I had come to “endure”. I had been told steak was a specialty at Matterhorn. The 30 day dry aged Black Angus fillet, is slow cooked and served rare – if you don’t like it like that, then don’t order it. I do and I was not disappointed. Logan Brown was exactly what I had expected. Supreme setting, in a beautifully restored 1920’s banking chamber, fantastic staff and food that really did live up to all I had seen and heard before I arrived. Unfortunately, I had to dash off to the airport so I didn’t have time for dessert, but for my entrée I had perfectly seared Nelson scallops with Chinese sausage and my main consisted of the best Duck Confit I have ever had. Cheers to Steve and Al for the hospitality. Wellington has, without a doubt, the best sport arena in the country. Westpac Stadium (or the Cake Tin as it is affectionately known) is the type of facility that every major city should aspire to. Pity the lack of visionaries in Auckland who couldn’t see past a feud with the Port Authority to design and build something of this ilk. The stadium’s proximity to the city centre cannot be under-estimated when it comes to adding value (and cold hard cash) to the local economy. Ohtel (Yes! It is spelt correctly) at the beginning of Oriental Bay is a newly opened 10 room boutique hotel. GM, architect and Ohtel’s designer, Alan Blundell has carved a bit of a niche in the accommodation stakes in Wellington with something totally vibrant and unique. It is capital chic with a capital C. Wine, food, chocolate and beer tours all abound. I was lucky enough to have a one-on-one Chocolate tour of the capital with Jennifer Looman from Wild About Wellington. A learned colleague of mine called Jennifer “a hoot” – I would use the word “passionate” in its place, but each to their own. Jennifer keeps her groups relatively small. Not only do you get to visit some exquisite chocolate outlets, such as Kirkcaldie and Stains, but you get to walk off a few of those extra calories you’ve just added on. The tour also encompasses some of Wellington’s history, as can only be told by Jennifer (there’s that passion again), as well as a trip up the historic Cable Car and other central city sites. Be prepared to jump on the odd bus or two as well – Wild about Wellington is carbon neutral!!! Wellington also boasts two very talented young women. What’s so special about that I hear you say? Well, both work at the Bolton Hotel (one of my favourite places) and they are award winning receptionists. Eve Stacey is the Top Receptionist in the World – it’s official, she won the annual competition in Cannes, France! She also won the NZ leg of the competition and colleague, Heather Firth is officially Wellington’s top receptionist. So you can see that by staying at The Bolton Hotel you are guaranteed of great service…just like I received. 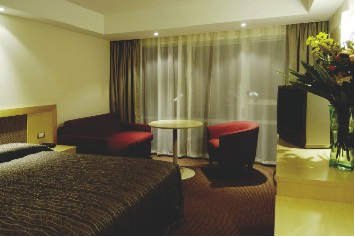 The contemporary design is bound to relax you after your travels – if you’ve come from London or Levin. I had merely come down from Auckland so a quick refreshingly cold beer at Café Brioche was certainly the order of the day before I freshened up ahead of my dinner at the Bolton’s restaurant, Bisque on Bolton. ? ?Renowned chef, Des Britten, called it “a new addition for those who want excellence”. The wine list, to say the least, is impressive, so I ran a little test for myself and asked my waiter to choose a wine match for each course. He did so with consummate ease and precision. My favourite? The matching of the Astrolabe Sauvignon Blanc with my crab and prawn medallion entrée. Sensational! As for educating yourself a little whilst in Wellington – the exhibitions at Te Papa change regularly. When I was there they had a Formula 1 exhibition and of course, if you are with overseas guests, you get to brag about our rich heritage and stunning wildlife. Wellingtonians are extremely proud of the fact Te Papa is theirs. That wasn’t always the way though. When it was proposed, much like the stadium, there was a lot of opposition. But, as the old adage goes – If you build it they will come! Once again it was time to walk off some of those calories I had “acquired” over the past few days. Zest Food Tours 4 hour signature tour ensures you see and learn as much about Wellington’s culinary side of things as you can. From Aubergine to Zucchini and everything in between all finished off by a light three course meal (with matching wines). Our Austrian guide, Manfred, had the same passion and fervour in his voice as those who support the Phoenix and call themselves Yellow Fever. Unfortunately with most of these whirlwind trips, hotel hopping is often a factor. So off to the Museum Hotel I go. My initial reaction when I saw it from the outside was one tinged with disappointment. ? ?Disappointment that evaporates as soon as you walk in the door. Its spacious lobby and opulent décor, with its walls adorned with original NZ art pieces, made me feel like I had sauntered back in time a little, to a bygone era where Lauren Bacall and Humphrey Bogart might meet. 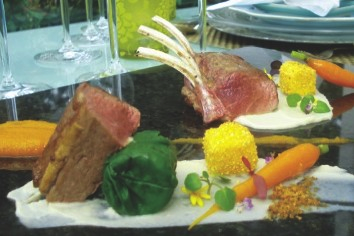 The Museum’s signature restaurant, Hippopotamus, is award winning and guests enjoy the French cuisine of Laurent Loudeac. C’est magnifique n’est pas? Wellington is an easy place to get around, central city wise, because everything is so close to everything but Corporate Cabs took care of me when I had wined and dined a little too much, which wasn’t hard to do. So – judgment day! 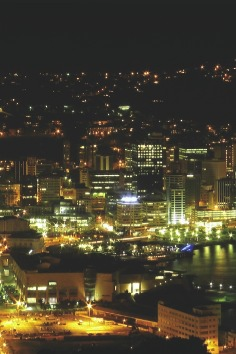 Is Wellington the capital for art, shopping, sport and dining in New Zealand? I think so, but get yourself there and find out for yourself. The Bolton Hotel?, Bolton and Mowbray streets, ?Ph 04 472 9966, Fax 04 472 9955, ?www.boltonhotel.co.nz?? ohtel, ?66 Oriental Parade, ?Ph 04 083 0600, ?www.ohtel.com?? Logan Brown?, 192 Cuba Street?, Ph 04 801 5114, Fax 04 801 9776, www.loganbrown.co.nz?? Matterhorn?, 106 Cuba Street, ?Ph 04 384 3359?, www.matterhorn.co.nz?? Martin Bosley’s, ?Royal Port Nicolson Yacht Club, 103 Oriental Parade?, Ph 04 920 8302, ?www.martin-bosley.com? ?